I hate falling in love with a game. Oh sure, Hot Pursuit and I had our differences (random crashes to the desktop, weird clipping and lag issues), but all-in-all, we were a happy couple. And then, EA and/or Criterion Games changed after the wedding was over. It didn't take long. XBOX and Playstation users (and probably Wii as well) have access to a cool add-on called the "Super Sports Pack" that adds new vehicles, tracks and racing modes to those systems. Those of us with PCs, however, have been left out of that one. If that weren't enough, they've released a PC Patch #2 for the PC users. It fixes the random crash problem (at least for me, and for now) as well as adds.... wait for it, you will NOT believe it... LOUDER engines. Yes, that's right. Whoopdie doo. Seriously? The volume of the engines was such a big deal that it required inclusion in an update?? Stupid. Here is the real problem: both of these additions/changes make playing games much harder because when one tries to join, often there is a "CANNOT JOIN BECAUSE OF INCOMPATIBLE VERSION" message that pops up. Thanks to these moves on EA's part, they have turned a game open to just about anyone and everyone with any kind of system to play against each other into a game that requires TONS more time finding "COMPATIBLE" games. I've trolled through the various needforspeed forums and have found many folks that have sworn off EA permanently (or at least they claim it, anyway). The console-only downloadable content started the furor, but the 102MB "update" seems to have really tipped the scales. I'm still playing because when I do find folks to race against, it is still a TON of fun. But, getting in brings the ol' blood pressure up for sure. As a side note: I suppose there are always those who like to spoil the fun for folks. I met up with one today. This person was out to get me, even if we were both cops (or both were racers). I guess every online game has "friendly fire" that one has to contend with. Oh well, as best I could, I gave it right back to him/her. That's all well and good, but it really takes away from the fun of teaming up with a fellow cop to take down a particular racer. 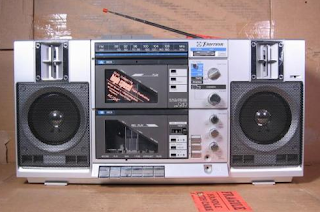 The other day, I found a picture of a portable "boom box" like the one I used to own back in the 80's (pictured above in this blog post). My friends and I would toss down the cardboard and try out our "breakin" moves. I will be the first to tell you, I was not very good. I could do the Centipede pretty well, and I had some of the "moonwalking" down. As for spinning on my head or any of the stuff where one quickly moves from standing to hitting the ground with one hand behind oneself, etc... Not so much. 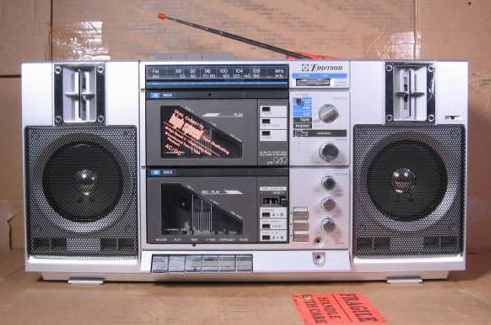 What I really remember most, though, is riding the school bus with my boom box "hidden" in my duffel bag. I don't know the pecking order of things on buses these days, but back in my day, the "cool" kids sat in the back. Now, what was "cool?" Well, generally, the troublemakers. That's where I fit in, but usually only when I had my box with me. Otherwise, I was relegated to the middle of the bus. The middle wasn't necessarily bad, and certainly nowhere near as isolating as sitting at the front of the bus. I fell somewhere between brainiacs and pot heads - though I was neither of those. I digress. I'd sit in the back of the bus and we would crank up the tunes - Ozzy, Sabbath, .38 Special, AC/DC... I got in trouble nearly every time, but it was worth it (or so it was as I saw it). What I don't remember is just how I got that thing into my locker... Or maybe I just carried it around in my duffel bag all day. I have no idea. It's funny, but the cassette in the picture sure seems to be one of those 'cool' Memorex jobbies that were clear with some red and blue accents with yellow wheels. I must have had hundreds of those at one point. I loved making 'mixtapes.' It's probably what started my desire to be on the radio. On the dual-deck system, I could record my voice while playing a tape in the top deck. The bottom deck would record the top tape *and* my voice. I don't think it was supposed to do that, but mine did when the switch was in the right position. Anyway, I would do song intro and outros and make my own tapes. When I moved from Pennsylvania to Colorado, I would make tapes to send back to friends then they would do the same. It was our way of writing letters. We'd talk about new songs we liked, school, whatever was going on. It's funny to think about it now, but one of the most common topics was whether or not we had heard the same songs across the country. I dunno, I guess we didn't think music "spread," and so the whole idea that we could hear the same song halfway across the nation was just novel. According to security firm Sophos, a click on the link takes users to a photo of the King of Pop wearing his trademark white sparkle glove. But following the scam directions won’t take users to a video, but rather to a page that asks people to install a fraudulent application. The application then asks permission to search the Facebook account holder’s profile and list of friends. In the end, victims are left with their personal information compromised, and no video of Jackson at all. Yes, that's right! 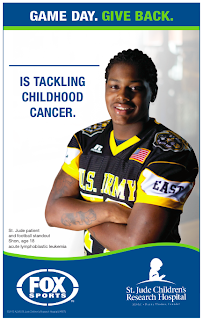 Attend my "virtual gameday party" and you could help the children of St. Jude's Hospital! Just click on the image below and please make a donation to help! This should wrap up my extended "review" of NFSHPLE. Really. Of course, you never know with me. So, what have I been doing with the game since my last post about it? Playing online with the Autolog system. Without a doubt, playing against other actual people (as opposed to computer racers/cops) makes the game a whole different animal. Some folks are out to take out anyone and everyone in the race - whether you are on the same "team" or not! The first couple of times I ran across these types, it really threw me for a loop. I though all the cops were supposed to work together to bust the racers. Evidently, some players didn't get that part of the memo. The Autolog system allows players to find and join friends online or the player can be assigned to a random race with other players who just want to get in there and have at it. Adding new "friends" is easily done by either typing the name a known racer (I knew no one) or by checking out the other players in the lobby while a race is being built. I have many friends in-game now, and those were added from the different events I've taken part in. 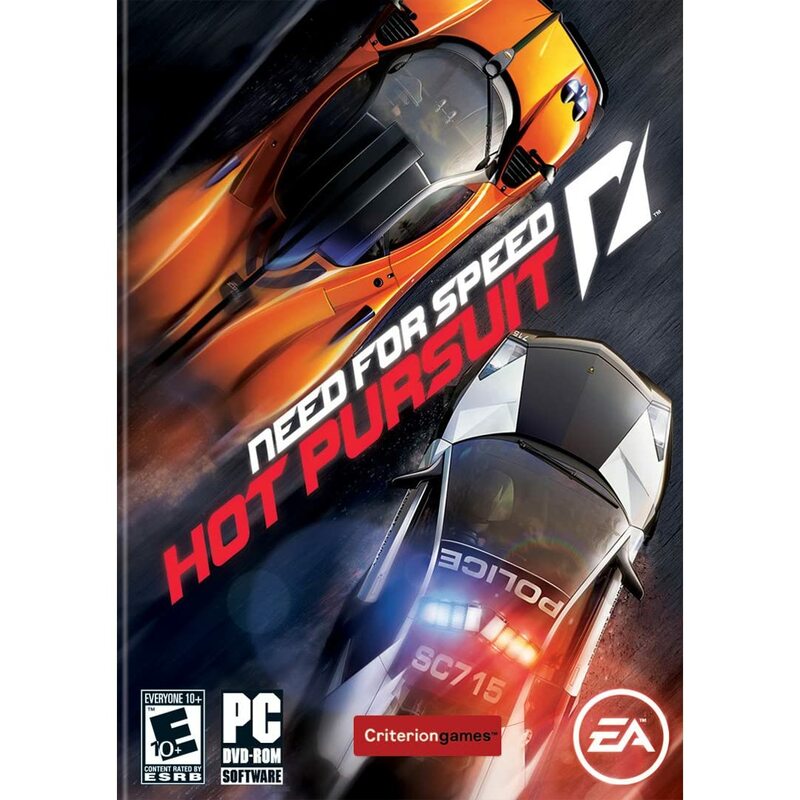 I generally prefer the "Hot Pursuit" games, though there are also "Interceptor" and "Race" modes as well. In "Hot Pursuit," players are divided into teams based on the number of players and the Bounty Level of the players. Up to eight people can compete at a time in each race area. The races are further divided by the class of car one chooses. I prefer the "Sports" cars (Porsche Roadster and Dodge Charger SRT8 being my favorites there), but I have also played in "Performance" (with the likes of Dodge Challenger SRT8, etc) and each of the other modes. When the race starts, each player gets to choose his or her car plus paint job (for racers). The cars start out already in motion, and the contest is on. Each "side" gets various weapons (spikes, EMPs, etc) to use against ANY other car on the road. If you are a racer, your goal is to survive to the end of the course. Cops try to keep that from happening. Sometimes, especially when racing with 'friends,' teamwork really comes into play. It is a lot of fun to have folks you've learned to know play along side you (even if they are on the other team). In "Interceptor," only two people play - one racer and one cop. I think I have done exactly ONE of these. There is no way anyone is going to wait around in the lobby, hoping some other player happens by. So, in my experience, "Interceptor" is best played when a friend is online. Head into the lobby, select "Invite Friends" and find an online partner to play. It is fun, but not as much fun as full-out Hot Pursuit mode. In "Race" mode, players choose the class of car then join a race. This is flat-out racing - no weapons, no cops. I've done several rounds of pure racing, but I'd rather be involved with a weapon-based duel. In one recent race, I crashed my car and the other racer (yes, just two of us in this particular one) took off. I could not catch up... Until the very end of the race. Literally, at the finish line, the other racer crashed into a passing non-racer and I did the same. Somehow, I managed to flip my car over the finish line and beat the other guy. Wild stuff! I enjoy racing against other players with similar Bounty Rankings, but my experience shows that Bounty Level has NOTHING to do with how well (or poorly) the other folks play. I've played against some Level 20's that don't quite seem to understand the controls and I've played against some level 2's that had me busted faster than I could even press the Spike Strip button one time! Whew! By the same token, some of the best events I've taken part in have been with just me (at level 15 and higher) against one other person (level 3 or lower). I especially like playing with folks that have only been online less than a week (one of the stats you can see). I like to try and "help" the player learn the ropes. Basically, I let them play with various weapons, tactics, etc. while they try to outrun me or gun me down (depending on whether they are a racer of a cop). The little voice in my head takes on that of Andre the Giant in "The Princess Bride:" - "I just like you to feel you are doing well..."
The biggest issue, as is the case with any online game, is LAG. The game does a very good job of keeping lagging players from messing things up during the race, but this often results in cars that disappear just when you try to ram them or cars that suddenly appear behind you, ramming your car when the map shows nothing. It makes playing very hard. I can't blame other racers, either. Our DSL is so random that sometimes *I* am the one lagging. In fact, during one race, the game popped up a message reading, "You have been booted because of your lag time." (Or something like that). I will say, though, I have had very few games where lag was an issue. The games are also pretty quick, with each lasting 3-7 minutes at most. My main complaint is the amount of time it takes for the game to move from the "Locked" stage in the lobby to the racing stage. The system gives the lobby a maximum of 60 seconds to get folks into the game. That's not the bad part. The problem is that sometimes it takes 3-5 minutes just to start the countdown. I don't know when ticks behind the scenes, but surely there would be a way to take care of that delay. With the delay in full effect, each race can easily last 20 minutes total, even though the actual RACING part is usually under 5 minutes. The lobby has no way to chat, though. It would be fun to be able to talk to the other players before or after a race. Oh well. A small price to pay for some online racing fun. Well, if you happen to grab a copy of the game, look me up: DavidInArk. I'm sure I'll be crashing into some random guardrail somewhere! Yes, feel free to sing the title of this post to the tune of the classic Pink Floyd song. The burst pipe we fixed last year at Mom's house (outside at the spigot) cracked again. Another 15-minute job goes for several hours. The main shutoff for the house is at least 50 yards or so away, near the end of the drive at the dirt road that runs by our "Ranch." I jumped in the car, drove to the cutoff, killed the water, then drove up to examine the damage. Turned out the only thing that cracked was the elbow that connects the water line to the spigot. Mom and I headed up to the local hardware store, bought some pipe, connectors, cleaner and glue, then headed back. The hardest (and by far the LONGEST) part of the project was cutting the existing pipe. See, back in 2007, Mom had new underpinning installed around her house. The guys did a great job, but in the process, they managed to stick the pipe between two 2x4's leaving about two inches within which to work on the piping. Ouch. I eventually got the pipe sawed off. I can't remember how far into the project I was before Shan's Dad came home, but he jumped right in to help. Once we had everything assembled, I turned the water on and we were good to go. For a few moments. While we were trying to figure out how to insulate the pipes given the limited working space, Shan's Dad moved the pipe a hair too far and suddenly we heard the WHOOSH of water! I ran down the hill to the cutoff and yanked the junction box open, then killed the water. It turned out to be a blessing in disguise. Evidently, one of the connections we fixed last year was not fully seated well. The pipe did not break, but rather 'popped out' of the connector. Whew! Easy fix! Shan's Dad glued things back together and we waited a moment before I headed back down to turn the water on again. Everything was working just fine. This Spring, I'm redoing the main water line coming to the house - going to have a main cutoff at the house. There is a cutoff at the house, but it only covers the water going into the house and not the water line going to the water hose. That will be fixed. Shan's Dad and I also talked about reworking the line so that we have more room to work it and so we can get it properly insulated. All I can say is that I'm glad our local school district had been closed due to icy conditions. I stayed home because getting out to go to the office just didn't seem prudent. I was home at 3:00-ish when Mom discovered the burst pipe. Sometimes we do (or don't do) things for which we do not know the reason nor the consequences. It's times like these that I tend to think God's guiding hand played a part in it. 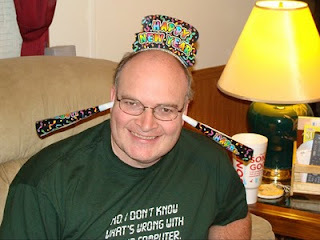 Okay, so the whole "daily photo" thing really isn't working out for me again this year. Instead, I'm posting a pic as often as I can (or as often as I remember, whichever comes first). We ended up with 8+ inches around our house on Sunday. 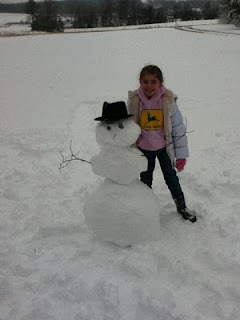 We spent Monday hanging out and playing in the snow. We made a small snow man and stuck my "Michael" hat on it! The kids did not have school (and I did not have work, since our office was closed as well) on Monday. The kids are also out on Tuesday, and given the mess that surrounds our area, I am also out. I think the real concern is the "re-freeze" that will take place tonight after the temperatures fall below freezing again. If you're out there in this bad weather, please be careful out there! Welcome, Mr. 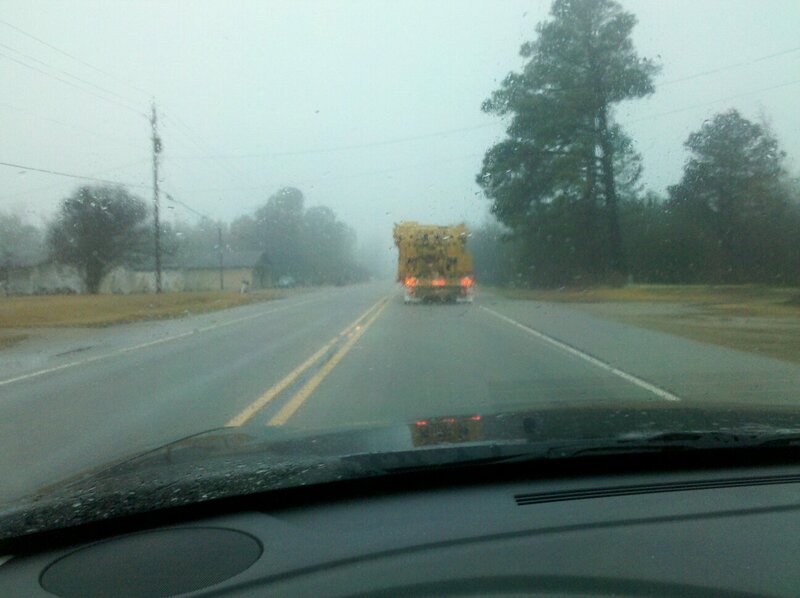 Snow, to Arkansas. It took you long enough to get here, but when you arrived, you brought your family - Mrs. Sleet and the Slush kids. 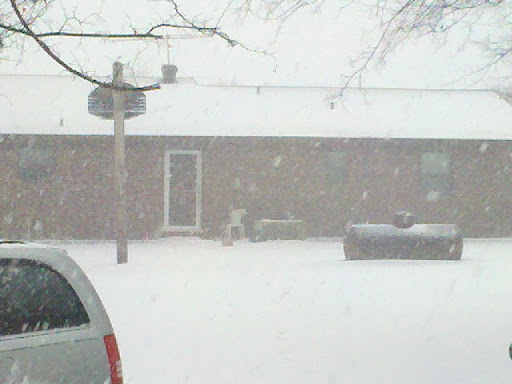 I took this with my Droid, so what you might be able to make out in the doorway to my in-laws (we live next door) is Emily. At the moment the picture was taken, she turned to one side. Just before I snapped the photo, she stood pressed up against the door with her arms outstretched. Naturally, that's moment I wanted and missed. Ah well, for as long as the snow is around, I'm sure there will be plenty of opportunity for photo fun! 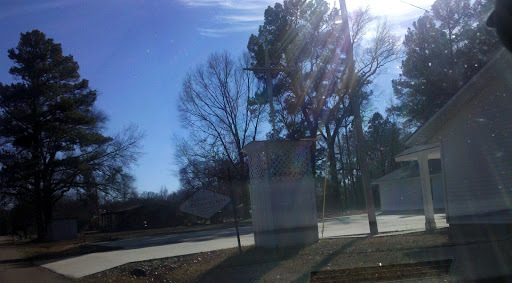 This photo was taken in "the Bronx of Boughton," as one of our friends calls it. One my way home from a meeting in Little Rock, I decided to take the "back way" to the house. Part of the road is paved up to this church (from the highway). Once you cross the railroad tracks just beyond the church, it's nothing but skinny country dirt roads the rest of the way to the house. I like taking the back way every once in a while because I usually don't meet any other vehicles (though I do meet up with a tractor or two sometimes), and there is just something fun about cruising down a country road with the dust pouring out from under your back tires in the rear view. In my Daily Photo #002, I had posted a picture from the car wash as I was heading in. This photo was taken two days later as the wet road lent themselves to an oversized big rig slinging mud and schmutz all over my recently-cleaned car. SIGH. I took this just after I had run the wipers over the windshield. You can see (maybe) how quickly things were getting nasty. Such is life, I suppose. She was working real hard trying to pass. She studied all night for the test she took. But she couldn't use the notes on her own MacBook. And he wouldn't change his mind, though she begged and pleaded. The dark red "F" was no surprise as the tears formed in her eyes. And the ways that you teach them have to change as well. But prepare us for the future and not your past. There's not one minute to burn. I need my teachers to learn." With his head hung low, phone in his hand. 'Cause he tried to post a story on his own blog. 'Cause an audience of one seemed a bit absurd. What ever happened to compromise? He said, "The school should realize -"
But prepare them for the future and not your past. They need their teachers to learn." There's a blue-eyes girl who's feeling down. She tried to bring her daddy into show-and-tell. He was gonna Skype 'em, wish them well. But they wouldn't let her do it on a school network. He was blocked by a firewall. They need their teachers to learn. Shan made chocolate cupcakes with molten chocolate chips inside! They are delicious! 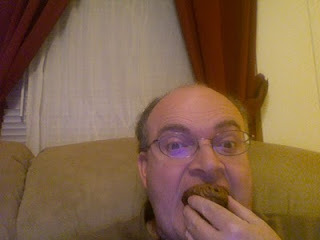 Now, what you don't know is that I had already started to take a bite when I decided to take a picture of myself taking a bite. While holding the cupcake in that same position, I had to open my MacBook, login, launch Photo Booth, and pose during the countdown before the photo. My son, sitting on the couch, looked at me and said, "Are you okay?" This was followed by, "Umm, are you savoring every bite, or what over there?" Don't ya just love kids? I did manage to hit a bug in the game during one race. I was trying to cut over into the oncoming traffic lane (you get a nitro boost for driving against the flow of traffic), and I pulled one of those weird Pinto-esque moments: I hit the divider, a fellow racer and two "Sunday drivers" at the same as hitting my Nitro button. I did an amazing crash, but when the car reset itself on the track, it actually reset UNDER the track! I could see everything above me (cars, scenery, boundaries, etc). I couldn't move, of course, and after a moment or two of hanging there, my car did a free fall into the nothingness that is outside of the game's normal design. 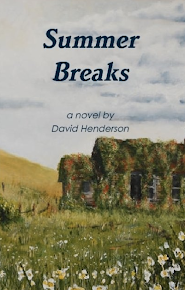 Everything went a weird smoky white, and a fter a moment or two with the nose of my car pointed downward like a plane about to crash, the game corrected itself again, and I was suddenly racing down the road again. It was more than a bit surreal. By far and away, my favorite way to play so far is in Hot Pursuit mode. I make a much better cop busting bad guys than I do as a bad guy trying to escape (or win a race while outrunning cops at the same time). I have not ventured online yet, which I plan to do this weekend. there are several "open world" modes that you can play where you join other racers and/or cops and freely drive around looking for trouble. My guess is that the game is much cheaper now that Christmas is over. So, if you didn't get a copy for the holiday, I say you grab one and strap in! This morning, I had a workshop at one of my area schools. 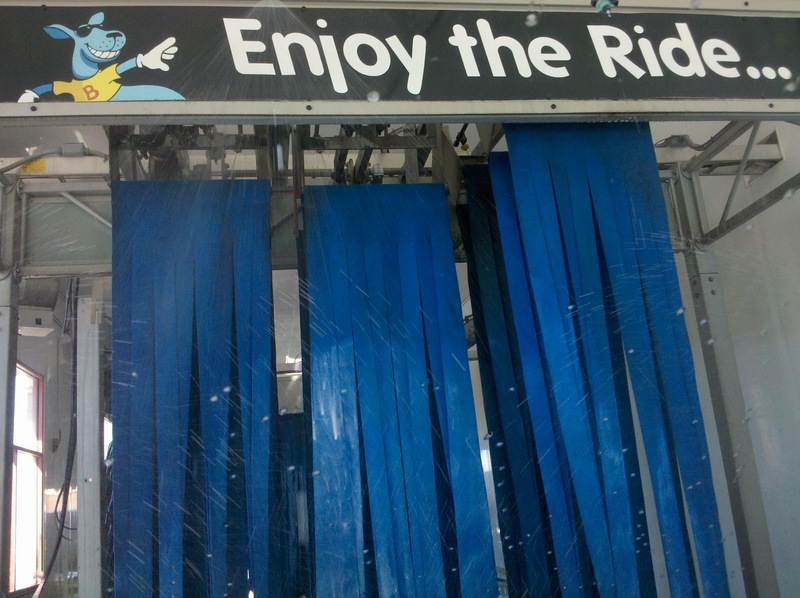 After the workshop, it was close to lunch time, so I headed over to the ride-through car wash (Boomerang in Texarkana) since I have a gift card with two washes on it. I decided the header over the "octopus thing" applied to life in general! For Christmas, I received MJTE for the Wii. I popped it in the console and fired it up. I wasn't sure what to expect because I had only seen trailers for the game online and on TV. When the menu came up, there options for "DANCE" and "TRAINING VIDEOS" (or something like that) and a couple other options that I do not recall just now. I immediately jumped over to the training video to see if I could pick up some tips before getting started. BZZZTT. You have unlock the videos as you play the game. That's all fine and well, but they should have given the players ONE video to start with. Instead, I was greeted with an essentially blank screen with no direction as to what to do. Eventually, I just went "BACK" and worked my way to the main menu. From there, I chose "DANCE." And then, the magic began. I am a long-time Jackson fan. Watching the familiar MJJ walk-on sequence brought goosebumps. Yeah, okay, so now it's called "Triumph" but those of us old enough to know the MJJ logo (the one with Michael on his toes and white lines shooting horizontally) will always know it as the "MJJ Logo." BTW, if you are not familiar with it, allow me to describe: A pair of feet (presumably Michael's) walks on to the screen from the right. Soon, sparkles start shining on the socks and then they fall off and bounce on the floor. When the feet stop walking, there's a little shuffle, a spin, and a guitar riff as he strikes the "on-toes" stance. When the game starts, the player is presented with a carousel of songs, each with an associated graphic. The songs range from known hits to a few lesser known titles and from his classics up to "Earth Song." It would have been cool if they had "This is It" on there, too. And, who knows, maybe other songs get unlocked as you play. I don't remember the first song I chose, but it was probably "Bad." No, it was "Thriller!" The videos are actually animated interpretations of his music mini-movies. This works really well for most songs, and really only serves as the backdrop for the animated "coaches" that appear on the screen. 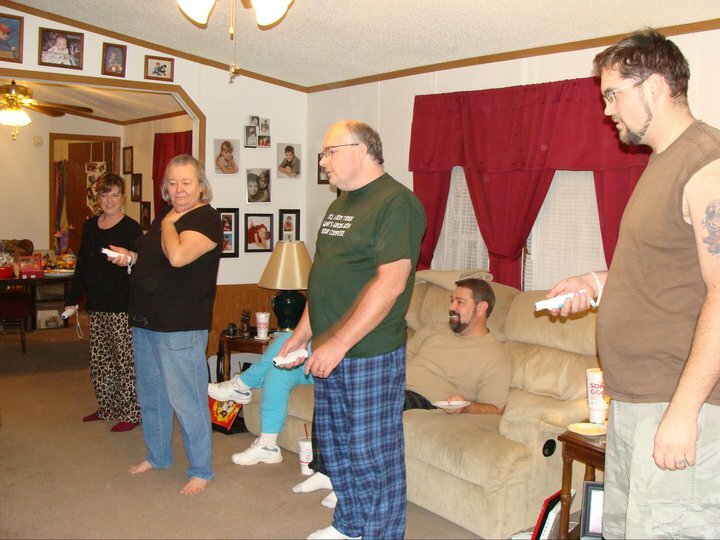 The player uses the Wii remote in the hand that would represent Michael's gloved hand. The music starts, and the dancing begins. The screen is laid out with icons in the upper corners, alerting players to upcoming moves. In the main area, the "coaches" perform moves that the players replicate in real-time. This can be thoroughly exhausting! I am talking killer workout here. Keeping up with Michael through his various twists, turns, crotch-grabs, etc gets fast and furious in many of his songs. Along the right and left sides, there are arcs that represent each player's "star rating." The better the player does, the higher their rating. Each player can get up to a level 5 star rating. You gotta be dogged good to get there. There are some "super moves" that appear during the songs, too. Perform those perfectly, and you get bonus points. My biggest problem when playing is that I keep watching the icons in the corner and forget that when there is no icon, Michael is on-screen doing stuff that I am supposed to be imitating. I often stand there looking like a statue while the "coach" is dancing up a storm. I'm sure practice will help with that. Emily, Shan, and I (along with Nick, Michelle, and Kay) have all played some, and we've unlocked several training videos. I have yet to watch any though. Ill let you know what those are like eventually, but I can't see firing up the game to watch videos - after all, I come to dance. As I said before, the game is a workout. We were physically and mentally challenged as we worked our butts off to match moves and worked our brains out trying to mimic moves and remember just how the choreography maps out during any given sequence. Whew! Last year, I started out doing a photo of the day. That lasted for a while, but quickly fell off. I am going to try again this year. The difference is that I am going to post photos of my own choosing. Using a "guided" program is great for some folks, but for me, it just made things harder. Also, these are pictures that represent me, my family, and my life in general. I have not had a drink of alcohol since sometime in 1990 or '91. I think it's important to say that because the picture above represents me *without* drugs or drinking. Could you imagine what I would be like if I *was* a partaker!? I would be so weird!